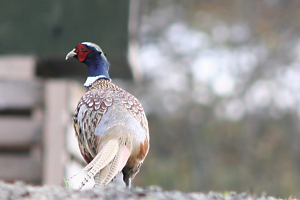 Observation - Pheasant - UK and Ireland. Description: found on a country track with 3-4 other birds who quickly scattered as i got the camera out, only this fellow stayed to see what i was going to do. brave chap! found on a country track with 3-4 other birds who quickly scattered as i got the camera out, only this fellow stayed to see what i was going to do. brave chap!